Since its founding in 1947, Albion has evolved into The Caster Experts and one of the most recognized names in the material handling industry. That's because we do more than just sell wheels and casters. We deliver custom-engineered, reliable solutions for the most challenging material handling problems. As a world leader in the design and production of institutional and industrial casters and wheels, our growth is built on the challenges nobody else will take. Many custom-designed casters have become industry standards. And experienced engineers equipped with the latest design and manufacturing technology create casters that deliver optimal performance for virtually every application, load size, work environment and budget. For over 30 years Buy Casters' has been a Master Distributor for Albion. Through those years we have developed and exceptional partnership with Albion collaborating on countless projects from custom designed heavy duty casters to OE solutions for display and manufacturing. Due to our partnership with them we can offer faster service with lower pricing on all of the casters, wheels and accessories Albion offers. They are famous for their exceptional quality on Heavy Duty casters and wheels, but the offer a full line of light duty and medium duty casters as well. Albion has been a valued member of our caster family, and will be into the future. Albion Medium / Heavy Duty Rigid Caster with 4 x 2" Phenolic Wheel. Albion Medium / Heavy Duty Swivel Caster with 4 x 2" Phenolic Wheel. Bearing and Brake options available. Albion Medium / Heavy Duty Rigid Caster with 5 x 2" Phenolic Wheel. Albion Medium / Heavy Duty Swivel Caster with 5 x 2" Phenolic Wheel. Albion Medium / Heavy Duty Rigid Caster with 6 x 2" Phenolic Wheel. Albion Medium / Heavy Duty Swivel Caster with 6 x 2" Phenolic Wheel. Albion Medium / Heavy Duty Rigid Caster with 8 x 2" Phenolic Wheel. Albion Medium / Heavy Duty Swivel Caster with 8 x 2" Phenolic Wheel. 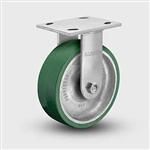 Albion Medium / Heavy Duty Rigid Caster with 4 x 2" Polyurethane on Aluminum Wheel.